Nonprofits that have bought into the notion of nonprofits as the poor stepsister to for-profits need to read between the lines sometimes to understand the degree to which we often have as natural assets the very things that others need to painstakingly attach to their structures. This article in Forbes on the use of providing access to volunteer opportunities as a millennial recruiting and retention tool is a case in point. “People bring their whole selves to work,” says Rachel Hutchisson, vice president of corporate citizenship & philanthropy at Blackbaud, a leading technology company that provides solutions to the philanthropic community. She is responsible for expanding the corporate social responsibility (CSR) efforts of its 3,000 associates, which drives her to survey the changing landscape of CSR. Before we go on, perhaps we could acknowledge that much of what is attributed to millennials is stuff that has been beaten out of some of the rest of us. Research has now confirmed that millennials are a generous and socially conscious generation, and some companies have come to the conclusion that a good way to recruit and retain high-quality millennial employees is to engage them in charitable causes that are important to them personally. Traditionally, this has come in the form of paid time off for employees to volunteer, or a company match for donations made by employees. 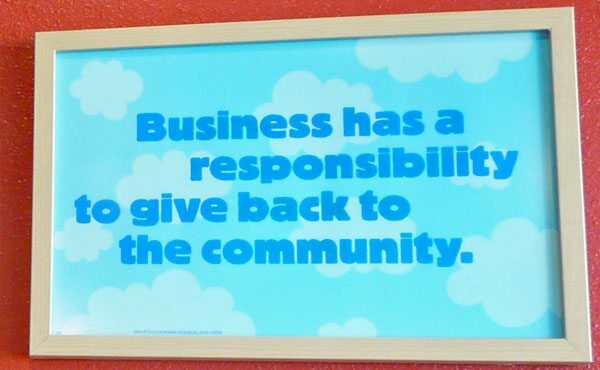 Some companies, however, have invested heavily in creating corporate social responsibility departments to lead the efforts in engaging employees in service. For instance, Mars, Inc., the candy company, created the Mars Volunteer Program, giving employees 16 hours of paid time off to take part in community service. Moreover, 90 employees are chosen each year to participate in an ambassador program that relates the goals of the company with their social responsibility goals. There are several benefits for employers to invest in corporate social responsibility beyond the fact that millennials like employers who do. For instance, for employees who are not high on the corporate ladder quite yet, community service events allow them to network and “rub shoulders” with company leadership. Concurrently, working side-by-side at these events allows leadership to learn from employees and benefit from their feedback. Additionally, engaging in community service allows leadership and employees to gain a different perspective on their daily stresses that can help improve employee relations and productivity. But, now for a statement of the obvious: Nonprofits have these opportunities in house! For purpose-driven workers like millennials—and many of the rest of us—well-designed nonprofit workplaces can create these same conditions and characteristics inside our work. The fact that some workplaces are still formed in the command and control model, with tasks and roles strictly cordoned off and little intentional mentoring, means we are wasting our natural resources. We are burying our human capital and then forgetting that we have it, and that is deplorably wasteful.